Arcam Q&A: Your questions answered | What Hi-Fi? We were up in Cambridge yesterday to take a look around Arcam HQ (don't miss our exclusive news story on the new Arcam products). In advance of our trip, we asked for your questions via the whathifi.com forum and Facebook page that we would put to Arcam. And now we have the answers. And there's some interesting information, from future products – including new DACs and a streamer – to the future of SACD and plenty more. Are there any new DAC models in the pipeline? Why do the late-2010 Apple MacBook Pro and 2011 MacBook Air have issues with the rPAC? Arcam: We have tested this on six MacBook variants and cannot reproduce the problem and we have many 1000s of rPACs in the field and have not had this reported. We will investigate further and contact you directly. Will using an rPAC with my Squeezebox Touch improve its sound quality or do I need to go further up the chain? Arcam: Glenn, the rPAC is a USB DAC, you need the rLink upgrade DAC with SPDIF input. This will make a huge improvement to your sound when feeding your hi-fi system. With computers progressively being the centre of storage and control of all digital media from Smart TV, Media Players and even PCs, why has no one included Freeview/Freesat radio as a hi-fi component – working without needing a screen powered or a computer or internet. Or is it that MP2 at 192kbps is as low in quality as DAB at 80-128kps? Arcam: It’s a nice idea, but too complicated to do in real-life, especially as Freeview/Freesat radio are based on TV/video components and would need a TV antennae..
Are you planning on making any other speakers? Give the Musos the floorstander treatment! Arcam: The Musos are specifically intended to go with our Solo components to make systems and are brilliant at that job. In fact they are one of the best Mini-Monitors on the market. Unfortunately it is not a realistic proposition for us to enter the hugely competitive mainstream loudspeaker market. I’d be very interested to know of any plans for a new entry-level integrated amplifier (I have heard rumours of a replacement for the A1) and any thoughts on how Arcam might develop the sound of their offering in the sub £500 sector. Also do they have any plans for a standalone streamer? 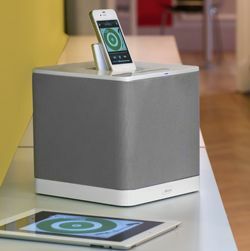 Any chance of the next Solo-Neo having an optical digital input (or two) and inheriting some of the iPod/iPad/iPhone compatibility of their rCube technology? Arcam: New dongles are highly unlikely with the 'coming of age' of Bluetooth and the spread of AirPlay. What are Arcam planning for rCube etc in the light of the lightning change, and what would timescales look like on that? Getting an iPhone5 this week, want an rCube, but don't know how long to hold out for them. We are waiting for Apple’s Lighting adapter to arrive but are fairly certain that iPhone 5 plus adapter will be fine in the rCube. Watch the Arcam Facebook page in a week or two. Any plans to replace the CD37 in the near future? Arcam: No plans to replace the CD37. But is worth noting that a lot of people are buying our BDP300 Blu-ray player as their main disc spinner. CD playback is as good as a high end CD player. Any news on a replacement (that works) on the midrange AVR500 AV amp? The 400 is not beefy enough (but does work), the 500 would be perfect in my budget range. The 600 is over budget. I’m an Arcam fanboy but the gremlins are putting me off. We all want an Arcam AV experience that puts those gremlins to rest. Ref the AVR600, like every other AV manufacturer we have had problems, however we have invested heavily and with the latest firmware have quashed the bugs in the AVR600 and units are very reliable. Anyone still having problems get in touch via the ArcamUK Facebook page. Arcam: We’ve thought about it, but the market is so overloaded we probably won't. Arcam: We’ve got no plans to change and will continue in the CD37 as long as we can get the transports. So there you have it. Thanks for all your questions and to Arcam for answering them. Some interesting information, we hope you agree, let us know in the comments below. Look out for news on the future Arcam products just as soon as we get it. In the mean time you can read up on the brand new Arcam FMJ A19 amplifier and the rBlink Bluetooth receiver. Look out for the next Q&A in the not too distant future and let us know which companies you would like to see involved.